Re: New Owner - Ben got an iMiEV - Again! Yep, sold the raspberry iMiEV. Yeah, he was the right guy to get the flooded iMiEV! My car is now completely solar powered. The garage is all built, although I still have a few small things to do on it. I have three NEMA 14-50 connectors in the garage. One is used for a heater, one has a more or less permanent (but unpluggable) 30A EVSE, the other is for a portable style 16A 240V EVSE. By the way, the AmazingE is a great L2 portable EVSE, perfect for the iMiEV. I made a video on the unit (http://300mpg.org/2017/09/02/amazing-e-evse-review-and-opening/), but unfortunately, it DOESN'T do 120V. I was really hoping it did, because the Gen 2 Chevy Volt charger is nearly identical, and it supports L1/L2 charging. I installed my own solar. It's 24 panels, each with a faceplate rating of 260 watts, but in the real and imperfect world, they really put out around 200 watts max each. Essentially It's a 5,000 watt system, which is really what I was originally aiming for. It's using micro-inverters, which simplifies installation and certain code requirements. I just got my utility rebate last week, so that was exciting to have a check written out to me for $1,200. Things are looking to be on track for a 6 year simple economic R.O.I., and possibly as quick as 3.5 years if a person factors in making one's own electricity for a car instead of buying gasoline. 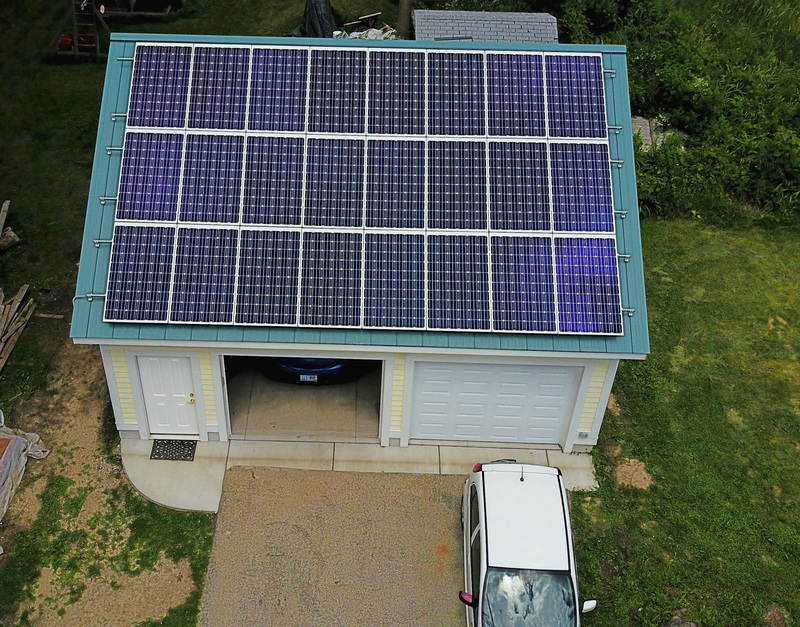 Because the solar can make 5,000 watts in the middle of the day, and the car charges at 3,300, I can actually charge the car straight off the solar, and have enough power left to run my house and still have a little bit to push to the grid! Whenever I'm home during the day, I try to do my charging then, to make direct use of the solar. Otherwise, I try charging overnight. Mainly, I try to avoid that evening peak power use time. I also have an idea for a semi-smart EVSE. I just found out that the PWM signal from an EVSE that sets the rate that the charger draws at can be changed WHILE A CAR IS CHARING, without causing an error or other issues. I don't think it would be hard to use a current sensor to see how much power a solar array is producing, and then vary the PWM output signal based on that. It would be done with a hobbyist microcontroller like an Arduino. For example, on a sunny day, a car could charge at maximum power, but when a cloud covers the sun, the current created from the solar would drop, the Arduino would sense that and send a the PWM signal to the car to charge at whatever lower rate. The car would continue to charge but at a lower rate. When the cloud moves out of the way of the sun, solar current would increase and the Arduino would change the signal allowing the car to charge at increased current. With a little programming, it would be designed with a maximum and minimum current setting, or so something like maximize the current of whatever is left from the solar that the house didn't use. In essence, it would put only 100% solar in to the car. There are plenty of places where grid-tie agreements aren't great. A person buys electricity for 13 cents, but only gets credited for 3 cents for whatever gets pushed back to the grid, for example. This smart solar EVSE would MAXIMIZE use for the solar by using the electricity that would be sold for cheap, instead of unnecessarily pulling power from the grid at full retail rates. Just an idea. I know I'd like to play with it and see how it works. I don't know if there's a market for such an item or not, but there are a lot of electric car drivers who also have solar! I've gotten my first two electric bills since installing the solar. Both were credits. In the first two months, the power company owes me $60. In the winter, I'll use more power than I produce, and the summer credits will be consumed by winter electric use. bennelson wrote: Just an idea. I know I'd like to play with it and see how it works. I don't know if there's a market for such an item or not, but there are a lot of electric car drivers who also have solar! It certainly makes sense - Make the maximum use of energy that power company would pay you very little for if you were selling it to them and reduce the energy you have to buy from them at full price - Also, maybe look into a small battery bank which would use the rest of your solar and then use the battery power for household needs after dark - Maybe set it up to run a clothes dryer or a water heater. I think there would be a market for it . . . . maybe not hundreds of customers, but it's certainly worth pursuing Ben - Go for it!! very nice looking installation and panels. They look like Astronergy panels I have on my roof. I am wondering if you have a plan to keep the micro-inverter on during power outage, in order to continue charging your iMiev ? eventually, you can pick up an "inexpensive" used iMiev/Leaf and keep it on your panels while your iMiev is out and about. Controlling the PWM would be nice and elegant. But for quickie, can you simply have a small PV driving a relay, which stops the PWM when the sun is not shining on it ? The SolarEdge and StorEdge products offer a lot of programability, so I'm hoping one could be used to charge only off the sun, do load shifting or peak shaving, and also provide emergency backup power. I've contacted Solaredge and the word is that the integrated inverter is essentially a grid-tie inverter with a built-in EVSE. So it will shut down without grid power, at least with the current release anyway later this year. It doesn't have a preference setting to use more solar power over grid. If a cloud comes over head and the solar roof put out less power, it just draws more from the grid...just like a regular EVSE. Ben's setup can use it since his panels and main box is right in the garage. It wouldn't work well if the iMiev is parked far away, since you want to keep high voltage DC line length to a minimum.